Kermans Flooring donated a beautiful area rug in May to support a wonderful local charity as part of their Rug-A-Month Giveaway. We selected the Megan S. Ott Foundation (Noblesville, Indiana) and donated the area rug to their silent auction event. The charity provides immediate personalized assistance to central Indiana recipients fighting the day to day battle of breast cancer. After Megan S. Ott Foundation was selected to be this months rug winner, one of their event volunteers stopped by the store to pick out a new area rug. She chose this beautiful and intricately patterned rug. Great choice! "We are so appreciative of Kermans for making this donation and helping our cause. The event and silent auction was a huge success! All proceeds will go to help Indianapolis woman and families battling breast cancer. Thank you Kermans for your generosity!" Area rugs add new life to your home. 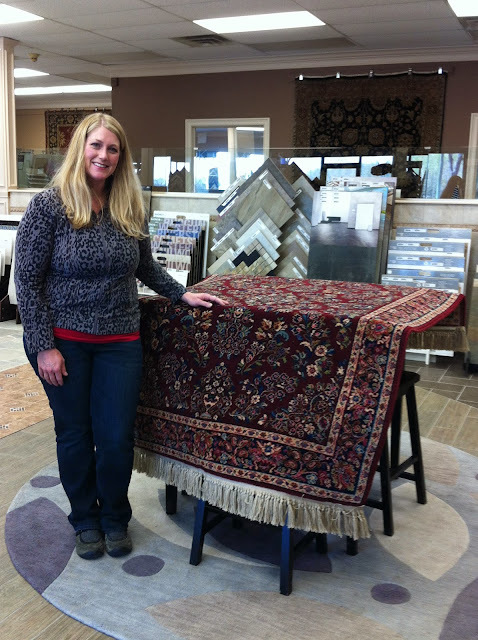 Kermans Indianapolis carpet store has design consultants to help you select the style that fits your needs and warms your home as well as offers custom rugs to perfectly fit your space. Learn more aboue area rugs on our website or stop by our showroom and let one of our design consultants help you find a new rug for your home. Will you be our next area rug winner? If you’d like to try your luck, enter now for a chance to win in our monthly giveaway. We select a new winner every month and will notify him or her by email or phone call.